Summertime in Warsaw is very different from winter here! The city buzzes with activity. There’s a free concert, movie in the park or some kind of activity every night and a festival every weekend! I cannot even keep up with everything that’s going on….though I do try! And it has been a pretty awesome summer in Warsaw! If you’re visiting Poland’s capital city or even if you live here, you might wonder what activities you can do for FREE or at very little cost. 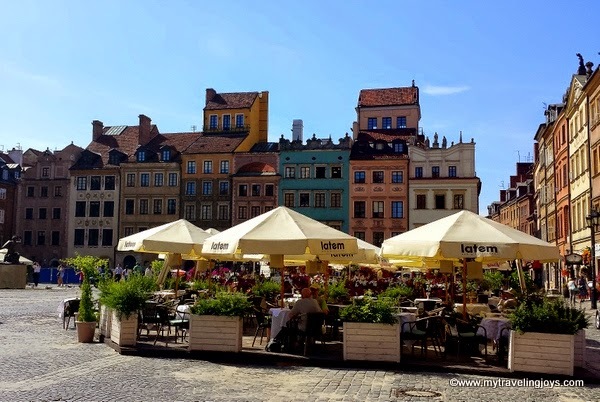 Well, I’ve finally compiled a list of my favorite summery activities to do in Warsaw (in no particular order) and am sharing those ideas with you. I hope you enjoy exploring Warsaw as much as I have! On Saturday nights in July and August in the Old Town Square, the city hosts free jazz concerts starting at 7 p.m. This year marks the 20th year for the International Jazz at The Old Town Square Festival. The square provides a picturesque surrounding to listen to jazz musicians from all over the world. However, the square gets packed! Your best bet is to book a table in one of the restaurants overlooking the square and treat yourself to some excellent live music with your meal. Or you can hang with the locals on the sidewalk and grab a cold can beer from the nearest sklep. On Friday and Saturday nights at 9:30 p.m. in August (and 9 p.m. in September), head to the Podzamcze Multimedia Fountain Park near New Town for a colorful music and light show. The 30-minute show features 350+ nozzles which are capable of firing water 25 meters into the air over the 3,000-square-meter pond accompanied with fancy flashing lights and stunning visual effects. I swear we saw Luke Skywalker in the fountain one time! If you plan it right, you can go straight from the jazz concert to the fountain show so you can find a place to sit in advance. The fountain show is definitely an enjoyable way to end the night after dining in Old Town. TIP: bring some bug spray to ward off the mosquitoes! A few weekends ago, we found ourselves in what is perhaps the most hip place to be along the Wisła River at night, especially at sunset. We joined several hundred other youngsters at Temat Rzeka and caught the tail end of the sun setting over Warsaw. We brought our own picnic blanket, hubby brought his own Polish beer in a plastic bag and I bought a glass of white wine with ice cubes from the nearest beach bar. Totally classy! The sun was rapidly setting as we walked across the Poniatowski Bridge near Temat Rzeka. Temat Rzeka, covers an area of 23,000 square meters, is a popular beach area by the Poniatowski Bridge on the Praga side of the Wisła. This summer, the space was even selected as one of the top 25 finalists for the 2014 European Prize for Urban Public Space. Temat Rzeka has such a relaxed and lively atmosphere. Maybe it's because everyone is BYOB-ing. If you want to party, the bars and beach stay open till 5 a.m. on Thursday, Friday and Saturday nights. It was nearly midnight when we left, but young(er) girls were still crossing the bridge in their party dresses and heading to the beach! Until September 28th this year, Polish and international pianists will perform classical Chopin pieces in front of thousands of people in Łazienki Park. All for FREE! This year marks the 55th season, as the concerts started as a cultural tradition in 1959. The Fryderyk Chopin Society contracts pianists for the whole season. Every Sunday, there are two concerts with the first one at noon and the second at 4 p.m. in front of the Fryderyk Chopin monument. As many as 4,000 people attend the concerts. I’d recommend arriving at least 15 minutes early if you want to secure a good seat. On top of a strange-looking, oxidized, green building is one of Warsaw’s best-kept secrets, and what I like to call the “secret garden.” The Warsaw University Library is covered with a two-tiered rooftop garden filled with bridges, a small stream, plants and sculptures. I love taking our visitors here! The 14-year-old garden was designed by Polish artist Irena Bajerska and offers panoramic views of lower Warsaw along the river, the Copernicus Centre and across the city to Centrum. It’s a wonderful place to explore or take a break in like you’ll see all the students doing when school is back in session. View of Centrum and the Palace of Culture from the Warsaw University Biblioteka's garden. 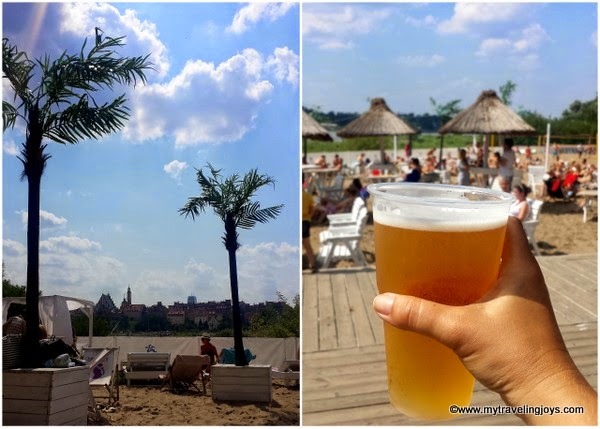 Until mid-September, if you want to pretend you are at a beach, head to LaPlaya, another popular beach and music night club on the Praga side of the Wisła. 2014 marked this tropical-style club’s 10th year. There’s no cover charge to access the beach club, simply pay for your drinks. What we liked best is that we could access this fun beach by taking a free, city-provided water ferry. 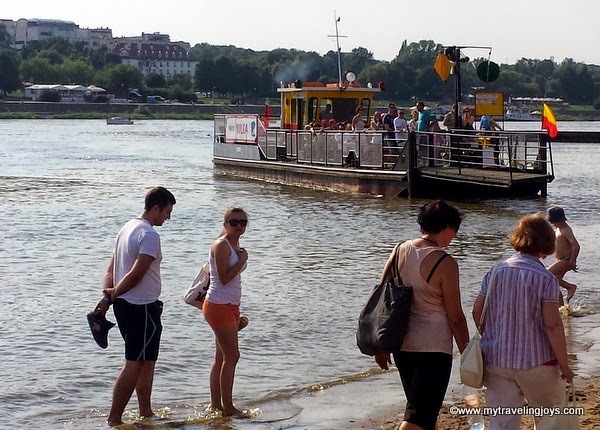 Look for the ferry boat named Wilga along the river near the Podzamcze Multimedia Fountain Park. The free ferries run until August 31 and include 4 crossings across the Wisła River: from the Czerniakowski Cypel, Poniatowski Bridge, Nowodwory and Podzamcze – Fontanny (at Sanguszki Street). Here’s the ZTM Ferry Boat Schedule. In order to get to those free Sunday concerts mentioned above, we often ride bikes thanks to the city’s convenient rent-a-bike system by NextBike. 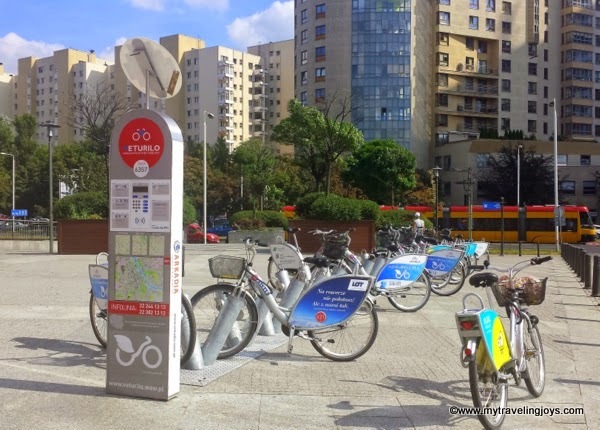 After paying an initial 10zl annual fee, we can rent bikes from more than 50 stations around the city. Rentals for less than 20 minutes are free, and 1 hour only costs 1zl. Warsaw has numerous bike trails and wide sidewalks that are perfect for long bike rides or quick trips down to the river. I’ve been using these convenient bikes more often this summer because my main tram line on Al. Jana Pawla is under construction. It’s often quicker for me to ride a bike 15-20 minutes rather than wait for a (never-on-time) bus or a different tram that gets me kinda close to where I want to be. My only complaint is that pedestrians and drivers do NOT pay attention to cyclists, so you must always be alert on the road and the sidewalk! Do you have any other recommendations for free activities to do in Warsaw? For more activity ideas, you can subscribe to a weekly email events list (in English) from the Warsaw Tourism Office. That’s how I stay up-to-date! No matter what time of day, it's always busy at Temat Rzeka with the National Stadium in the background. 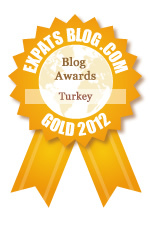 We are moving to Warsaw next year and I just found your blog. Really nice to see all these fun things to do there! @wellthatwasdifferent - Great! Warsaw has a surprising amount of things to do here. Though wintertime is a bit more tricky! ;-) Please keep in touch with me as I'm happy to try and help! For Warsaw, it is a really nice place!